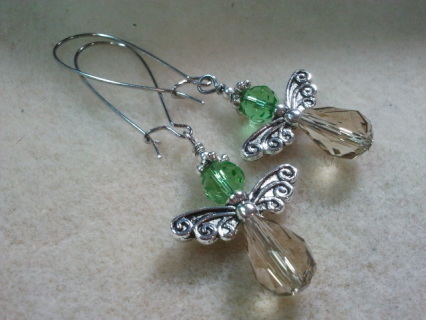 Beaded earrings with Peridot color crystal beads and silver toned lever back hooks matched with silver toned wings & findings. Beaded earrings with Light Sapphire color crystal beads and silver toned lever back hooks matched with silver toned wings & findings. silver toned lever back hooks matched with silver toned wings & findings. Beaded earrings with Yellow Topaz color crystal beads and silver toned lever back hooks matched with silver toned wings & findings. 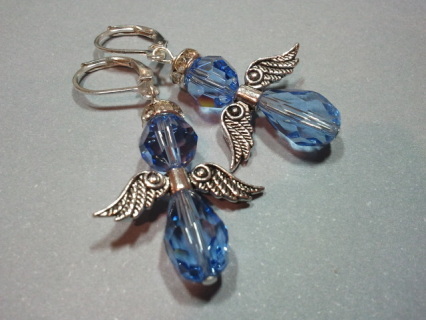 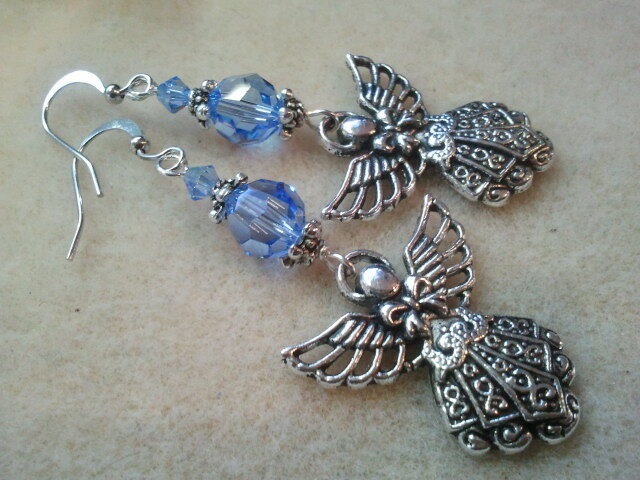 Blue Sapphire Crystal Beads matched with Silver plated Angel with heart Charm dangles with leverback hooks . 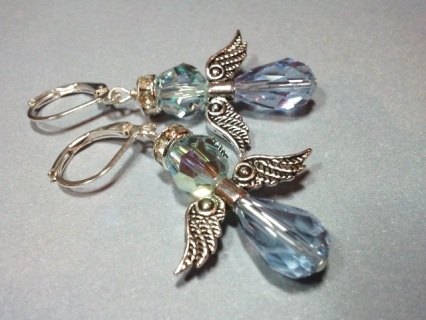 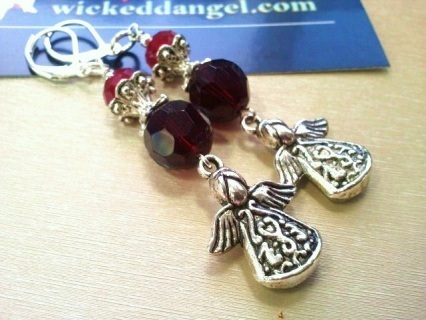 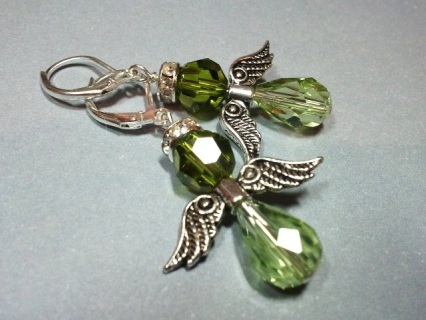 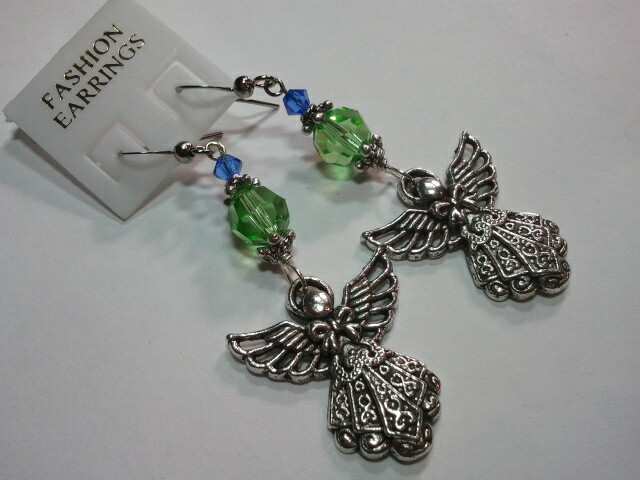 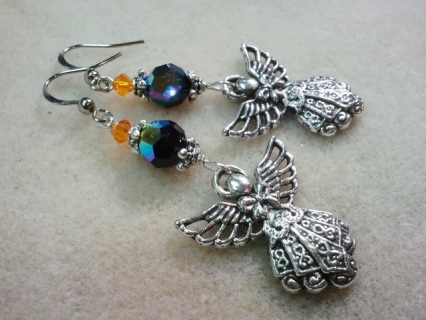 Angel with heart Charm dangles with leverback hooks . Pretty Angel charms with Garnet Round Crystals & Red Coral tone Crystal Rondelles are matched with highly silver plated leverback hooks and metal findings. Measures Approx 6cms including hooks. 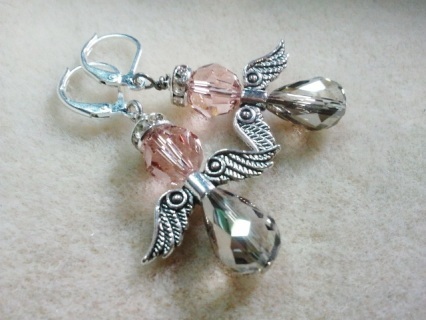 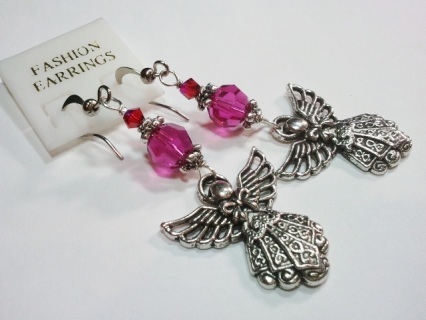 Beautiful & well detailed Angel charms with Pink Opal Swarovski Round crystals matched with silver plated french hooks and metal findings . 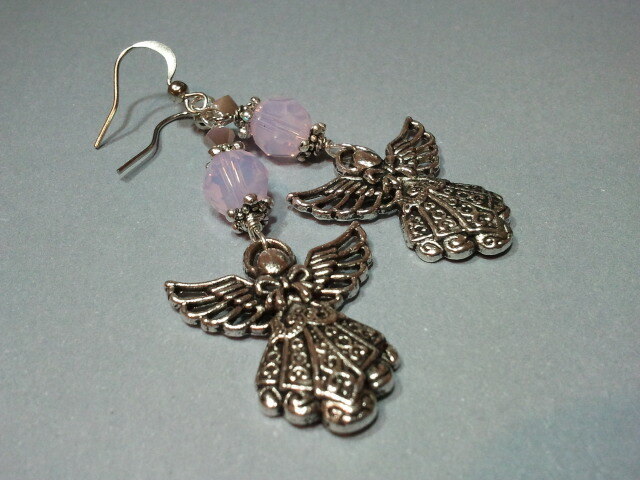 matched with silver toned 2.5 x 2.5cms Tibetan Silver Angel charms & findings. Measures approx. 6cms including hooks. 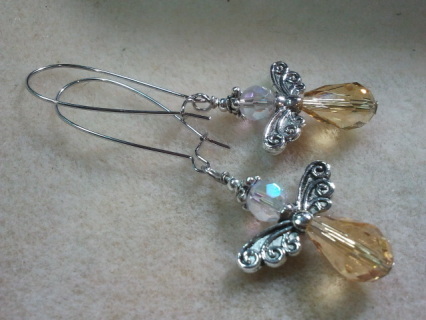 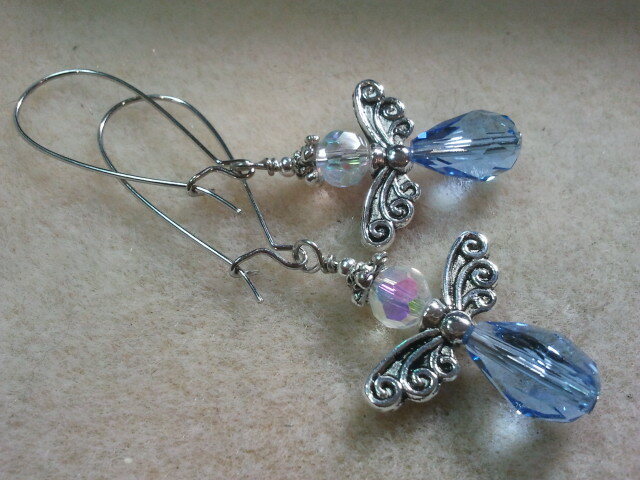 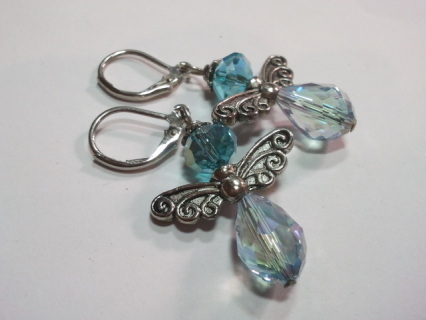 Swarovski bicone crystals with silver toned French hooks . Beautifully matched with silver toned 2.5 x 2.5cms Tibetan Silver Angel charms & findings. 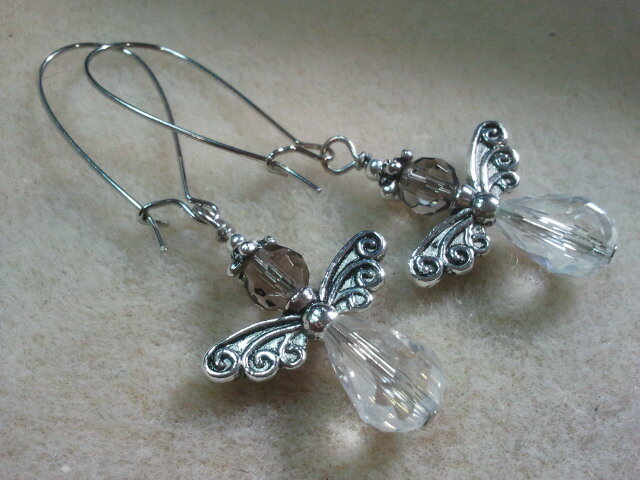 2xAB Swarovski bicone crystals with silver toned French hooks . 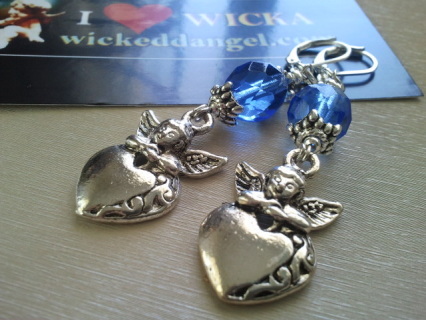 Beautifully matched with silver toned 2.5 x 2.5cms Tibetan Silver Angel charms & findings. Beaded earrings consisting of 8mm Dark Sapphire color Swarovski crystal round beads , 4mm Swarovski bicone crystals with silver toned French hooks . 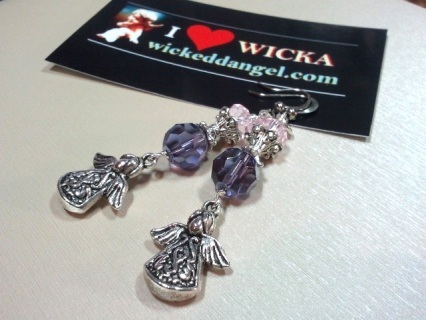 Beautifully matched with silver toned 2.5 x 2.5cms Tibetan Silver Angel charms & findings. 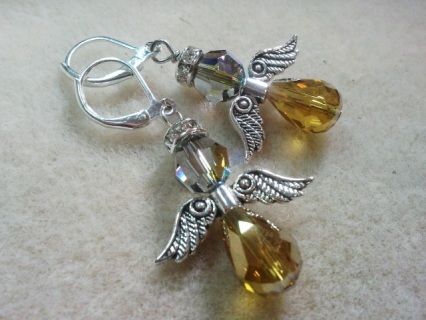 Lovely sweet angels in 8mm Crystal AB and Yellow Topaz Drop beads hanging on a Kidney Loop. 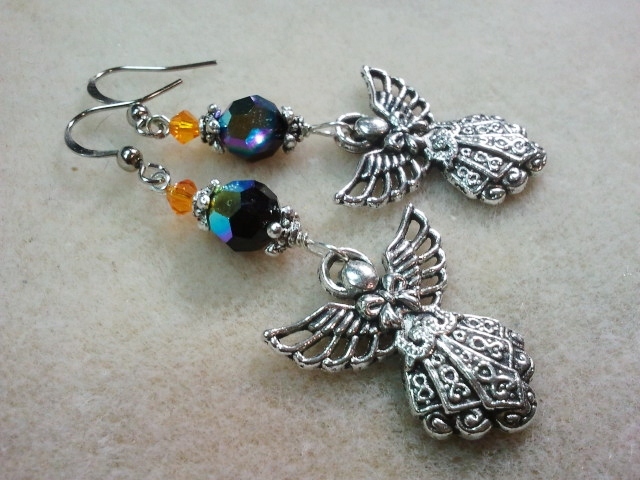 Matched silver tone metals and well detailed angel wings. 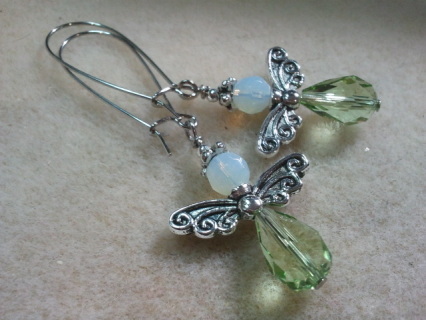 Lovely sweet angels in 8mm Round Opalite and Lt Peridot drop beads hanging on a Kidney Loop. Matched silver tone metals and well detailed angel wings. 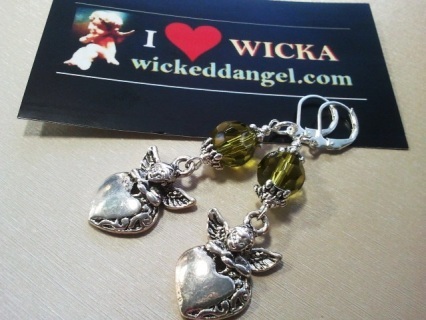 Lovely sweet angels in 8mm Peridot and Smoky Topaz Drop beads hanging on a Kidney Loop. 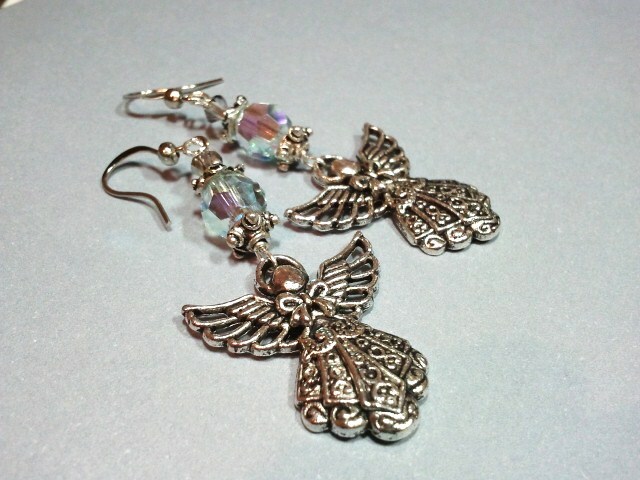 Matched silver tone metals and well detailed angel wings. Aquamarine Crystals Rondelles and faceted drops with Silver plated metals and leverback hooks. Measures about 4cms including hooks. 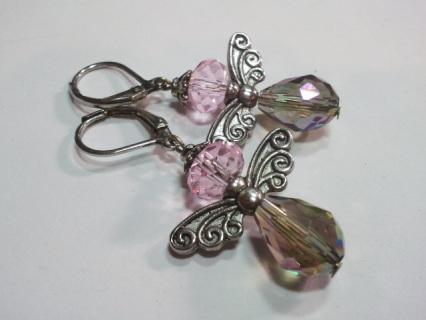 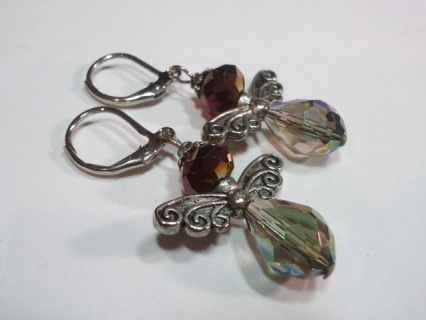 Vintage stle Dark Magenta Rondelles with Topaz AB Drop beads in silver toned leverback hooks and wings. 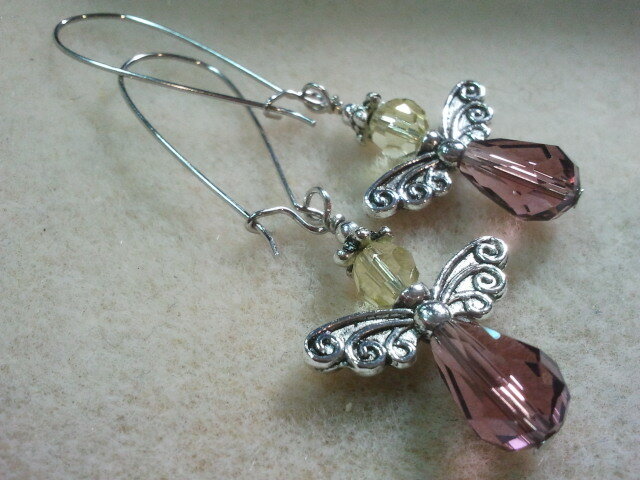 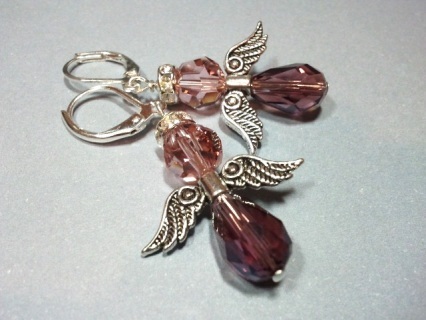 Lt Pink Sapphire rondelles matched with smoky Topaz AB drop Beads with silver plated metal wings and findings. 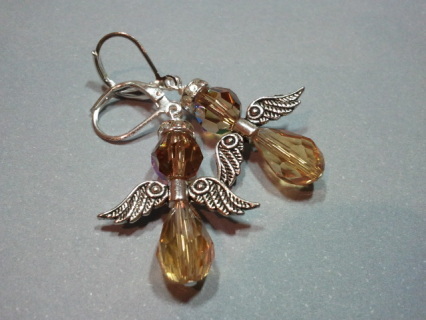 Beaded earrings with Citrine color crystal teardrop beads and 6 mm Smoky Topaz AB Swarovski Crystals with silver toned lever back hooks matched with silver toned wings & findings. 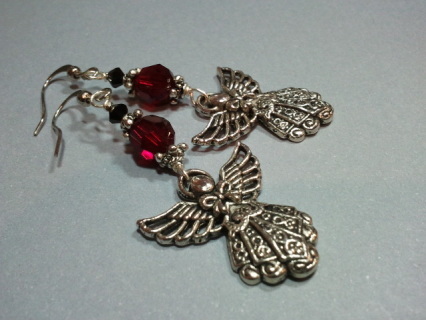 Beaded earrings with Silver color crystal teardrop beads and 6 mm Old Rose Swarovski Crystals with silver toned lever back hooks matched with silver toned wings & findings.